We are looking for ways to enhance and accelerate crop breeding, leading to varieties that are targeted to thrive in specific and challenging environments. 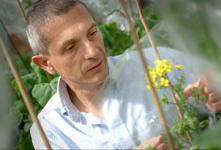 The Vegetable Genetic Improvement Network (VeGIN) is a Defra-funded project to bring together research focused on key vegetable crops. The Network encourages collaborations between industry and researchers to address how genetic improvement of crop varieties can contribute to a sustainable increase in food production to meet the twin challenges of food security and climate change.